first I want to thank you for taking my favorite Java IDE into PHP realm! I'm already loving it and appreciate your work very much! But then, I want to help improve WebIDE by reporting various issues I came across while testing it with a few current projects. I tried using the ftp sync feature with various ftp servers and I'm always getting the error message "Failed to change timestamp of the file 'foo.php'". But I know that at least on some of the ftp servers I tried the command "SITE UTIME" is available. So how does WebIDE try to set the timestamp then? It should be possible to also invoke the "Quick Documentation Lookup [Ctrl-Q]" in the parameter list of a function. I stumpled upon this while editing a "date()" function, the first argument is the format which takes multiple identifiers like "d" for day or "m" for month. They are visible in the documentation but it was not possible to have it open while in the parameter list, so I had to move back to the function, press Ctrl-Q, remember the identifiers and then enter them in the argument several times. I can't seem to be able to rename a file without refactoring. Would it be possible to have another context entry "Rename" right above "Delete" in the Project Navigator? Ctrl-Shift-Enter is supposed to complete a statement. This is working well in HTML, but in PHP the cursor only jumps to the next line, but I would expect it to add the ; at the end of a statement too, or to add the curly braces on if, for etc. I'd love to see some kind of parameter preview on php functions just like in Aptana Studio. Essentially when autocompleting a function the IDE inserts the parameter names already and they can be navigated using [tab]. I think it would fit the overall workflow in WebIDE well. In case you don't what I mean I attached a screenshot showing the feature in Aptana Studio. When writing an html tag with some attributes like <table >, on pressing [tab] on the location indicated by [here] I would prefer the curser to move after the next " and add a space instead of adding an actual tab. This would greatly increase speed for writing multiple attributes on a tag. Also navigation between attributes using tab would be a nice feature anyway. I'd appreciate your feedback to these points. In case someone can confirm these or I don't get any response at all I will file them into YouTrack as Bugs/Feature Requests respectively. On #5 I was thinking the same thing, but when I ran the code check in the IDE it looks like they are not finished with inputting all the php native functions in yet, so this might be a feature that will be in the final release. It appears it checks for validity of function parameters but it doesn't give details or hints yet. I think another thing to go along with this is code coloring. In Aptana you can color php native functions different from others, and this is very useful for me. 1. Feel free to open ticket so we can investigate the problem. 2. Quick lookup works for element under cursor - this includes any parameters, so this is not possible. Open feature request - may be we can work something out. "On #5 I was thinking the same thing, but when I ran the code check in the IDE it looks like they are not finished with inputting all the php native functions in yet, so this might be a feature that will be in the final release. It appears it checks for validity of function parameters but it doesn't give details or hints yet"
Also you can always post tickets directly to tracker, sticking to ticket-per-feature/problem rule. I added a comment to the request suggesting this for conditional and loop structures too. I setted up data source. How I can invoke autocomplete for tables names at least in .sql file (WebIDE 94.149)? Or it isn't supported yet? 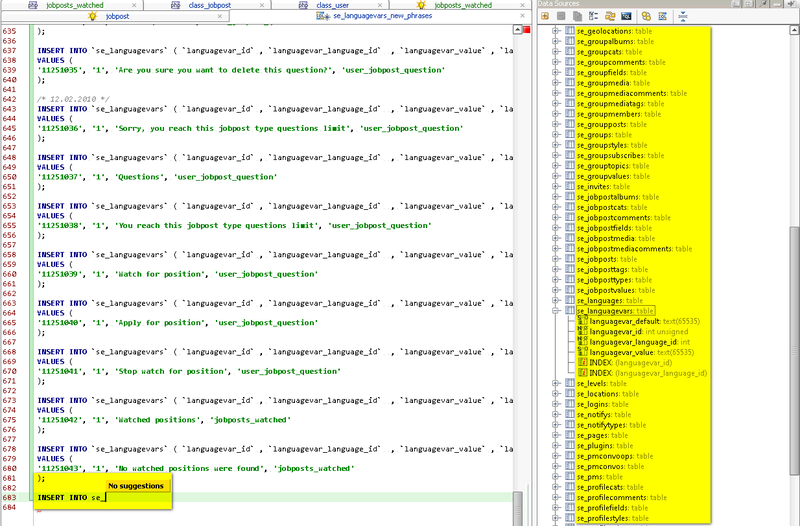 Unfortunately with Ctrl+Space I see only list with SQL operators, not tables names. slightly off topic, but with regard to (5) - does anyone know if there's a way to turn the parameter info hint on by default so it shows all the time rather than requiring me to press ctrl/cmd-p?